Make yourself these tasty and healthy truffles with a touch of chocolate. These little energy bombs can be eaten as a healthy snack or dessert. Melt the cocoa butter on a low heat. Put all the ingredients together in the blender and mix until you get a homogenous mass. The structure must be such that you can easily roll balls with it. Roll about 20 balls and put them on a plate. Put them in the fridge for an hour. For the topping you take 3 small plates with each their ingredient. 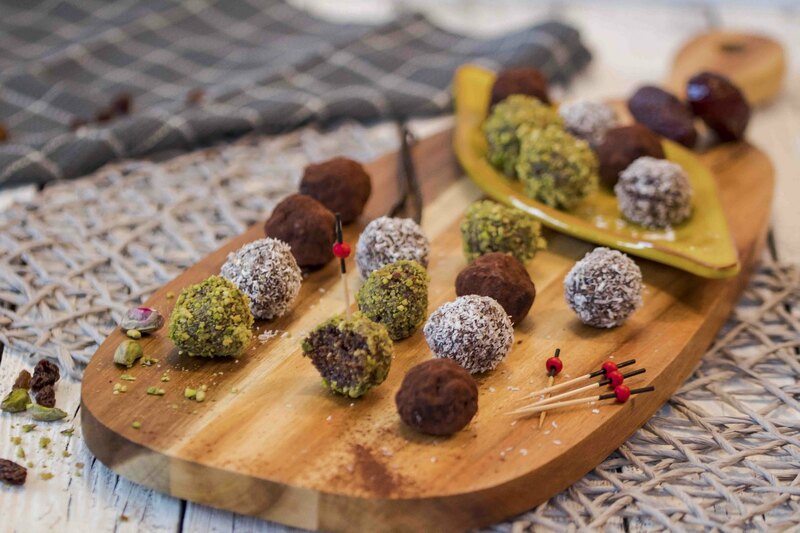 (cocoa powder, grated coconut and chopped pistachio nuts) Roll the balls one by one through the desired topping. (You can also do this before putting them in the fridge and repeating it after an hour) You can easily store them in the fridge for a week. The topping will then be less crunchy. they are rich in potassium and magnesium, which can lower blood pressure. they are rich in fiber. Fibers give you a feeling of fullness and provide better digestion and bowel function. In addition, fibers can also have a cholesterol-lowering effect. Watch out! 100 g of dried dates can contain up to 60 g of sugars. These sugars are natural sugars (fructose) but can also cause fluctuations in blood sugar levels. So eat them in moderation! Raisins are dried grapes so you can keep them longer. Raisins are sweeter than grapes because 90% moisture disappears. 100 gr raisins can contain 64 gr sugars. They are rich in fiber, which gives you a feeling of fullness and promotes bowel function.